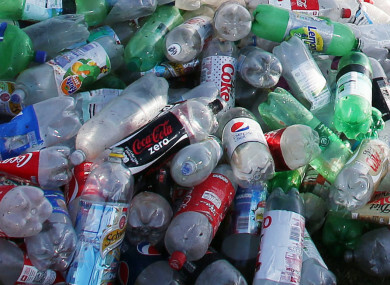 The Environment Committee voted to ensure the set up of a bottle deposit scheme is compulsory. CHARGES FOR HOUSEHOLDS will rise by up to €1 per lift for the green bin collection if the plastic bottle deposit scheme is introduced, according to Environment Minister Denis Naughten. The additional charge will be needed in order for private waste companies to recover their losses, said the minister, who added that such a scheme will only increase plastic collection nationally by 3%. Naughten hit out against members of the Oireachtas Environment Committee who voted in private session this week on the wording of the Waste Reduction Bill. The Bill was introduced by the Green Party last year. The party argues the new set of measures could improve how Ireland recycles its waste. On Tuesday, the committee voted against the minister’s position by seven members to five members to ensure the current wording of the Bill, which states it would be mandatory to bring in the Deposit and Return Scheme (DRS), remains in place. “I was disappointed that some members of the Environment Committee decided to put politics and the next general election before a genuine attempt to deal with the problem of plastics in our environment. “I have been working with the members of the committee to try to progress the Waste Reduction Bill to the next stage of the legislative process because there are good proposals in it, which could have a real impact on reducing waste and plastics particularly,” said Naughten. The minister said he had one issue with the Bill, which would prevent him allowing the Bill progress to the next stage, and that was the compulsory nature of introducing a deposit scheme. “I am not opposed to a deposit and return scheme in principle, but because it would cost approximately €116 million of taxpayers’ money to implement, I need to be absolutely positive that it would work and be effective,” he said. Green Party Leader Eamon Ryan disputes the cost of rolling out the scheme. He said the sale of collected materials should cover about a quarter of the costs. Unclaimed deposits will cover between quarter and half of the costs, while producer fees will be set to make up the shortfall. Naughten said that without a complete understanding of the cost implications on the taxpayer, on household bin charges, on employers, on retailers and on families it would be financially reckless of him to proceed with its introduction without proper scrutiny and using an evidence based approach. In the private committee meeting, the minister outlined that €65 is paid to waste collectors for every tonne of household packaging waste collected by Repak (Repak subsidises the recovery and recycling of packaging waste collected by Repak approved waste management companies). Plastic bottles and aluminium are the more valuable material available in the green bin, said the minister. The removal of these materials from the green bin by introducing a deposit scheme reduces the value of the green bin contents, he said. He argued the cost will be passed on to the householder, and added this will force collectors to make up for lost revenue through increasing waste collection charges. Due to the green bin being subsidised for householders to ensure packaging placed on the market is recovered recycled through the existing kerbside collection system, Repak members would have to reduce the existing subsidy for green bin collection as this funding would be diverted into establishing and implementing a deposit scheme, added the minister. Naughten suggested to the committee yesterday that a pilot project be launched first to assess the deposit scheme. The pilot scheme has been earmarked for Cashel in Tipperary. The minister said this would provide evidence and help inform any future decision on introducing the scheme. “If it had significant impact I would look at rolling it out throughout the country,” he said. “Instead of agreeing to this, members wanted to force the spending of €116 million on a scheme to improve recycling rates by 1% while imposing a cost of an extra €1 per lift on a families’ recycling bin,” added Naughten. He accused members of the committee of “greenwashing”, stating that it is a measure that gives the impression that it is a green initiative rather than being a real and substantive measure to improve the environment. Hitting out at members of the committee, he said they were “not happy” with the evidence the government had presented. The meeting was held in private on Tuesday. The minister said the committee made the decision to hold it in private session. “I wanted it to be heard in public session,” said Naughten. Green Party leader Eamon Ryan said the committee didn’t want it in private, but this was due to Oireachtas Standing Orders. Email “Minister says bin charges will rise by up to €1 per lift if bottle deposit scheme introduced”. Feedback on “Minister says bin charges will rise by up to €1 per lift if bottle deposit scheme introduced”.